Work out safely and cheaply in the cold. If you want to start the new year feeling strong, fit and energized, then exercise. If you want to feel that way and save money, then exercise outside. Or, you could pack into gyms and fitness classes, which can be as expensive as they are crowded this time of year. A single SoulCycle class can set you back $30, for example. Find your reason: On frigid days, you may need a compelling reason to unplug the electric blanket and face the cold. Reflect on that motive. “If you can figure out your real, true, deep reason for wanting to be fitter or stronger, that can really drive you,” says Kristen Seymour, co-owner of the website Fit Bottomed Girls. Improved fitness may help you keep up with your energetic toddler, for example. Or maybe looking and feeling healthier will boost your confidence in the workplace. Reward yourself: By working out, you’re creating an “opportunity to give yourself a personal victory and feel good about yourself,” says Erika Nicole Kendall, certified personal trainer and creator of the blog A Black Girl’s Guide to Weight Loss. So reward yourself for that victory. Upon returning from a cold workout, Kendall treats herself to “the world’s hottest shower” and a cup of tea. Then, she reflects on the accomplishment. “I got out there, and I feel good about that, and now I can approach the rest of my day feeling better,” she says. 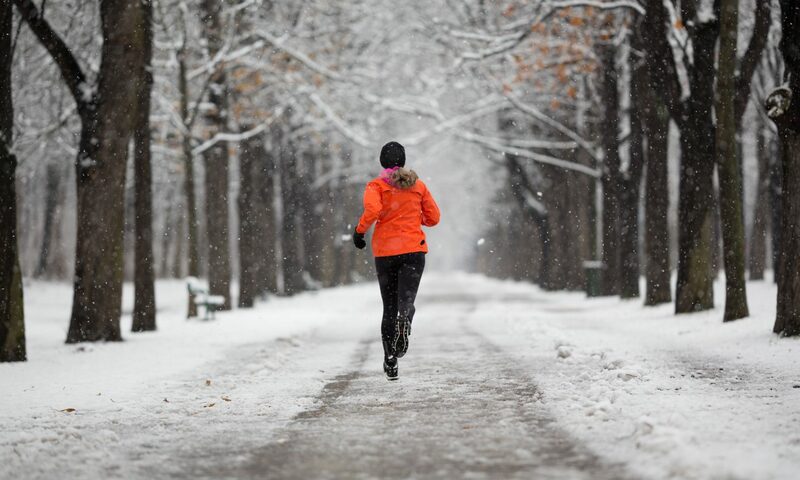 Enlist friends: A running buddy shivering at your doorstep is motivating, too. Seymour recommends routinely exercising with “someone who can be supportive and hold you accountable and call you out when you don’t show.” That may be a friend, co-worker or new acquaintances you find online, like a community running group. Load up on layers: “It’s not about putting on as many layers as possible — it’s about strategic layering,” Kendall says. The Mayo Clinic suggests starting with a base layer of moisture-wicking material. Top that with a fleece or wool shirt, followed by a waterproof and breathable outer layer. You may have to experiment with this formula, depending on the temperature and your workout intensity. This wardrobe doesn’t have to be expensive. Kendall suggests scouting T.J. Maxx, Marshalls and Ross for low-priced gear. Also, she says, subscribe to email lists of nearby sporting goods stores for sale alerts. Dress for safety: Cover your ears and hands, which are vulnerable to frostbite. And exercise in the rain, snow and sleet only if you’re sporting waterproof gear. If it’s slick out, check that your shoes have plenty of traction, too. Make sure others can see you. After all, the shorter the days, the more likely you are to wind up exercising in the dark. Amazon sells plenty of reflective and LED vests, lights, wristbands and tape for $10 or less. Consider your medical conditions: The Mayo Clinic recommends talking to your doctor before exercising in the cold if you have asthma, heart problems or Raynaud’s disease. Check the weather: The Mayo Clinic also suggests exercising indoors if temperatures are expected to dip below zero, or if wind chill levels are colder than minus 18.